NASA astronauts Terry Virts and Barry Wilmore switched their spacesuits to battery power at 6:52 a.m. EST, signifying the start of today’s planned 6-hour, 45-minute spacewalk. Virts is wearing a spacesuit with red stripes and is designated EV1. His helmet camera displays the number 20. Wilmore is wearing a spacesuit with no stripes and is designated EV2. His helmet camera displays the number 18. 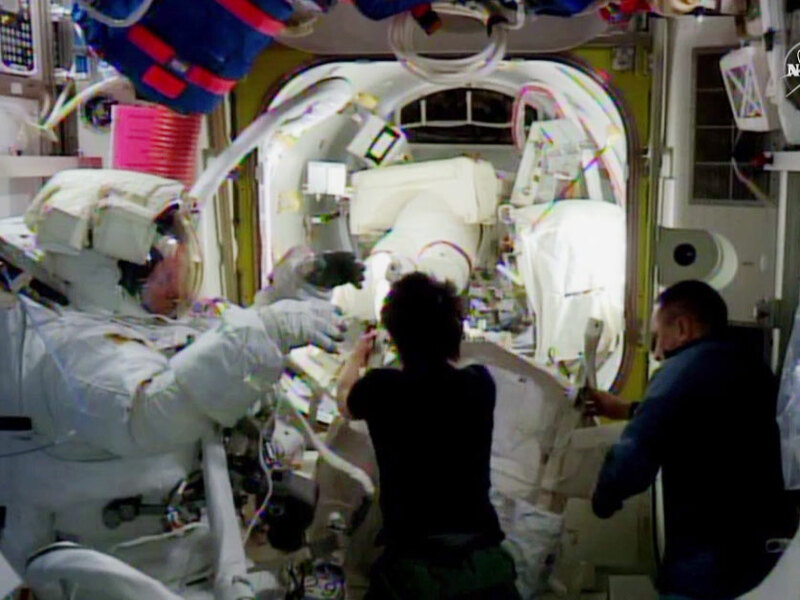 This is third spacewalk for Virts and the fourth for Wilmore. Virts and Wilmore will install 400 feet of cable along the space station’s truss and other equipment associated with the Common Communications for Visiting Vehicles (C2V2). The system will be used by crewed commercial spacecraft to rendezvous with the space station in the coming years. Hello and hi my big brother barry wilmore and all team of members nice to meet you again with honest love your welcome in my heart with love for fevor india and all honest countries in this world,I have intrest fly in the space with you,Iknow am a special person in this world for emizing work,I do miss for you with space,iam wating.